D stands for quite a lot of things in the knitterly world: Dutch, Dalarna, Delsbo, Dales (as in Yorkshire) or even Design, but since my husband’s family has roots in Denmark, I have settled on two: Danish & Damask. The test square pictured here is a damask “D,” a sketch for an eventual Danish garment for my husband. I’m afraid at this stage, that’s all there is to it. Textile scholars generally agree that knitting took hold in Scandinavia first in Denmark in the sixteenth century. Knitting traditions in Denmark apparently owe much to Dutch families who settled on the island of Amager, near Copenhagen. They brought their own styles with them and passed on their patterns (favoring simple, knit-purl designs) to Danish workers. From the seventeenth century onward, the Danish favored fabrics that were textured, as if they were damask. In knitting, damask does not refer to the lustrous, reversible jacquard fabric that makes such wonderful upholstery. Rather, damask knitting is textured through simple purl stitch patterning, and is technically (but not visually) reversible, like woven damask fabrics. Damask knitting of the sixteenth and seventeenth centuries imitated aristocratic garments knit the same way, only of silk and much finer, which were an expensive English export. The traditional Danish knitted garments most often referenced are the nattrøjer, a tight-fitting night shirt, and the skrå-trøje. Beth Brown Reinsel has developed classes and patterns for both. Follow the link to get more info about her skrå-trøje design (about which I know absolutely nothing except that I want to make one!). Another traditional Danish design is the sømandssweater, or sailor’s sweater. Here’s an image from F. C. Lund’s portfolio, “Dansk Nationaldragter” from the Historiemaler Series (Kolding, 1915). 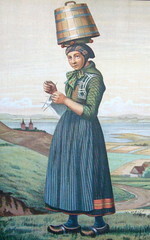 Lund’s series is on historic Danish folk costumes, and interestingly, several of his models knit or wear knitted garments. This image depicts a girl from Refsnæs (in north Jutland, or Nordjylland), who knits while she walks in wooden shoes, also carrying what looks like a cask of butter on her head. More recently, Denmark has been in the knitting news for the work of Danish designer Vivan Høxbro. She has explored domino (another D!) and shadow knitting to produce some really unusual fabrics. Her kits are distributed in the US by Harrisville Designs. Brown-Reinsel, Beth. 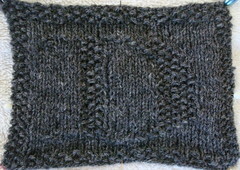 Pattern for a Danish Nattrøjer, Interweave Knits (Winter 2004). Rosing-Schow, Lita, “Two pairs of knitted gloves from Denmark and a Man's Danish Gloves to knit” Piecework Magazine, Special Knitting Issue (Jan.-Feb. 2008). A nineteenth-century knitting sampler that includes a textured alphabet that is neither Danish nor damask, but is English and recalls what might have been an inspiration for the knit-purl damask knitting fabrics.